Got muffin top? Fighting the Battle of the Bulge? You’re not alone. The stubborn muffin top – a roll of fat that’s visible when wearing tight-fitting, low-waist pants – can happen at any age, but tends to become more of a problem as we get older. Changing hormone levels are often to blame, as they can cause an increased storage of fat in the stomach area. At Noydeen Beauty, our clients share with us how they diet and exercise and still struggle with the belly fat. 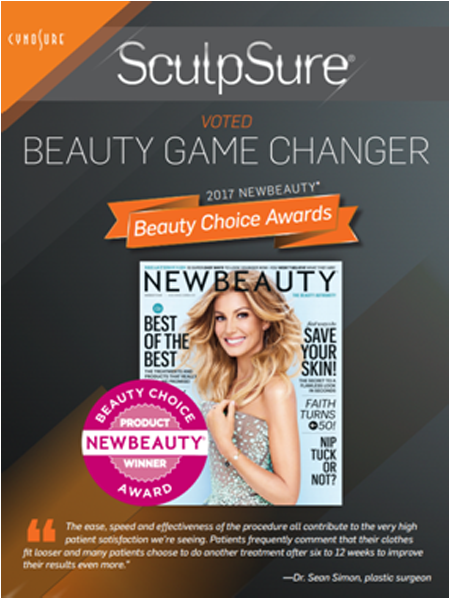 At Noydeen Beauty, we offer the latest noninvasive fat fighter, SculpSure. Using diode laser technology, SculpSure obliterates the fat under the skin. The laser energy is transmitted through the skin and then absorbed by the fatty tissue which is the main target. In doing so, the energy is absorbed by the visceral, fatty layer by heat which in turn destroys the fat cells.